Ruthmarie Fogg Obituary - Mays Landing, New Jersey | Boakes Funeral Home, Inc.
Ruth Marie Devine Fogg, 74, died on the 30th of June, 2018 at home in Mays Landing, NJ, surrounded by her close family. Mrs. Fogg was born on April 14, 1944 in Philadelphia, Pa, the daughter of Francis and Helen Devine. She attended Hallahan High School and Chestnut Hill College, both in Philadelphia and upon completion gained employment as a proofreader. She married William Fogg on December 17th, 1967 and moved to Southampton, PA where they raised their two children. She worked with her husband, Bill, at the family adhesive company. Ruth enjoyed spending time at their summer home in Ocean City NJ and moved to Mays Landing to stay close to both the beach and her family. She became a member of St. Katharine Drexel Parish in EHT. 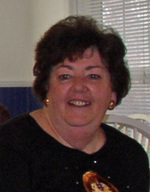 She was active and involved in the Church and enjoyed the prayer group and the friends she made through it. Ruth was especially proud of her role as a grandparent to her four grandchildren, who she 'loved to the moon and back'. In addition to her parents, Ruth was predeceased by her brother, Joseph Devine. Surviving, in addition to her husband, are her sister, Rosemary Devine of Westchester, PA; her son, William Jr of Warwick, NY, his wife Elena and their children, Alex and Chase; her daughter, Alison Fogg Hay of Mays Landing, NJ, her husband Mike Hay and their children, Teagen and MacGyver. Funeral services will be private. A Funeral Mass and luncheon will be held on August 17th at 11:00 AM at St. Katharine Drexel Parish, 6075 West Jersey Avenue, EHT, NJ. Those wishing to remember Ruth in a special way may make donations in her memory to St. Katharine Drexel Parish.